CDMA Trainer (2131/2131ER) provides a basic understanding of the concepts behind CDMA, and various issues that need to be considered in the design of OSSS system. These include generation of various pseudorandom (PN) codes like gold, MLS & Barker with programmable tapings, variable chip rate, and digital modulations BPSK, QPSK & digital AWGN noise with programmable FIR low pass filter. 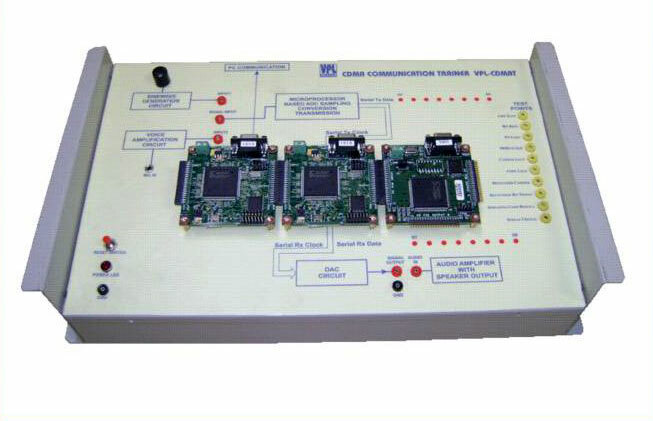 In VPL 2131ER Model, Bit Error Rate (BER) measurement with known data sequence, overall data rate dependency parameters, spreading & dispreading with OSSS, SNR control, offset control & so on can be performed.